Leaving San Gil, Colombia we had a couple choices on routes. One more paved and the other back into the dust and dirt. The amazing terrain of the day before convinced us to stay with the dirt and continue exploring the back roads and small villages that make up this beautiful region of Colombia. The dust was still heavy but the roads we found our selves on were even less traveled than the day before. In some areas they were completely grown over with grass. After lunch the dirt came to an end and put us at the foot of Colombia’s most eastern stretch of the Andes that make up Parque de Nacional Natural El Cocuy. After a large military checkpoint the road began to climb into the clouds. The higher we rode the smaller the towns got until we finally reached the mountain village of El Cocuy at around 10,000 feet. Rolling into to town at dusk, we ran into a friend that was on our sail boat from Panama to Colombia. It was awesome to see him and he directed us to the super cheap hostel he had found. 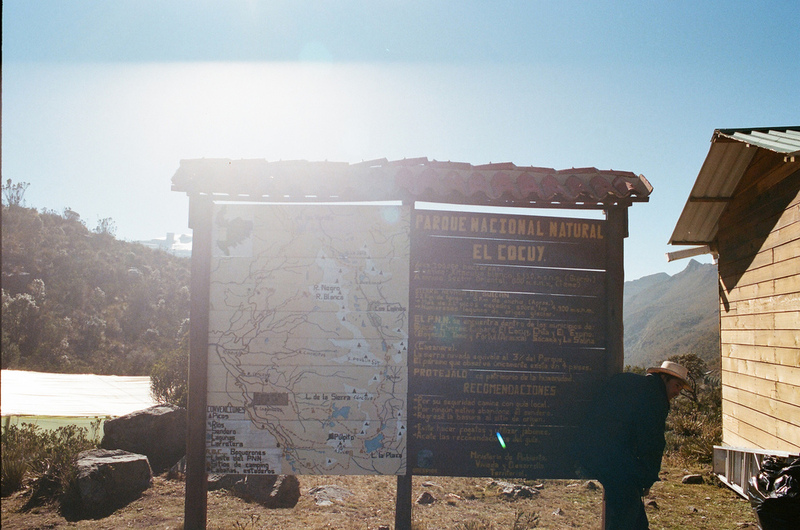 El Cocuy is the last town before entering the National Park. It would be home for a couple days while we got acclimated and organized for a weeklong trek circumnavigating the park. We spent the days tracking down food and supplies from the small selection of stores and gathering information. The picking was incredibly slim and we settled on pasta, tuna, oatmeal and snickers bars for the week. During our research of the route we discovered that the area we wanted to enter had recently been closed to public. It was a huge bummer because we were really set on doing the loop and had gotten ourselves super excited about it. After talking to some locals and other hikers we were told that the closure was due to conflicts between the government and indigenous tribes that call the mountains home. The government was letting huge tour groups from Bogota operate large and disruptive trips through the indigenous peoples land, but not compensating them for it. Digging a little deeper, we were told that no one was out there enforcing the closure aside from the rangers at the entrance to the park and that the indigenous people aren't really concerned about individuals hiking the route. With some hope and a stoking to our fire we spent the rest of the day gathering maps and packing our bags for an early start in the morning. We reluctantly rose from bed at 5:30am to catch a ride with the morning milk truck to the edge of the park. The milk truck leaves the center square every morning to collect all the milk produced by the surrounding farms and it is the cheapest way to reach the park from El Cocuy. Over the next couple hours we bounced along the tiny dirt road and watched men pour fresh steaming milk into a large drum in the bed of the truck. Watching the sunrise over the mountains and seeing the snow capped peaks come into view was incredible. Two flat tires later we were dropped off at the small ranger hut at the entrance to the park. We signed in and told the ranger we were going on a bunch of day hikes, hoping he would not quiz us too hard on our route ahead. On the ride up we shared the bed of the truck with a couple from Colorado, Anna and Miguel. They drive busses in Rocky Mountain National Park during the summer and spend every winter exploring the world. There was an immediate bond between us and without saying it I think we all knew that we would be spending the week together. We set off as a group of 4 towards the first pass of the day. By now we were hiking at over 12,000 feet and the elevation was becoming very apparent under the load of our packs. The only obstacle between us and freedom was one last ranger post that would be reluctant to let us proceed on a “day hike” with gear and food for a week in the backcountry. We made a game plan and took an alternate route around the building hoping no one was looking our way. We got lucky and as the trail curved out of sight we all took a minute to relax knowing we were in the clear. After cresting the first large pass of the trek we laid eyes on the terrain that would be home for the week. It was truly breathtaking. From were we were standing everything drains east into the Amazon basin and other than the trail ahead there was no sign of human presence. We dropped down into the valley below and set up a quick camp as heavy clouds started rolling in. Just after we finished dinner it began to snow/rain. Exausted, we all took shelter in our tents. Even though it was only 7pm none of us emerged till the rising sun woke us in the morning. Not all of us slept well though. Jordan woke up looking like he had been tortured all night. The altitude had kept him from sleeping and had his head ready to explode. At first it was looking like we would have to backtrack to lower elevation but a concoction of black coffee and Excedrin saved the day and had Jordan smiling and laughing again with in the hour. After a quick breakfast we hit the trail hoping to reach Laguna Grande by mid day were we would spend our second night.